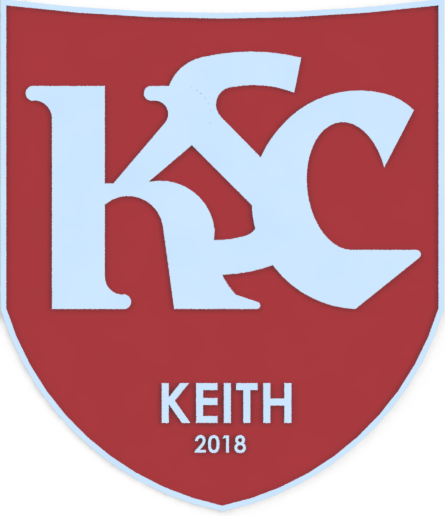 The first home game of the season proved to be bittersweet for all involved with the Keith Supporters Club. Even after an impressive win in our opening game away to Clach, only the most optimistic of Keith fans would have expected to take anything from a somewhat tougher Broch side. The positive to be taken from the match however, was the reception given to the all-new Keith Supporters Club by the fans. After arriving at the game an hour before kick off, within minutes I was met by two KSC members who had signed up online. It was fantastic to put faces to names, in particular David Innes who has kindly volunteered to make my online ramblings make sense. Once I’d met and greeted new members, and got the new-look stall up and running, within a matter of moments I thought we had a queue of fans at the table looking to sign up. On further inspection, however, it was clearly the away support queuing for the pie shop. Nevertheless they were very supportive of what we’re trying to achieve with the club, and were impressed with loyalty system we have on offer. Around 20 minutes before kick-off, KSC Secretary Stooie ducked his way through the turnstile, and that’s when the magic started to happen. Many say that his talents as a painter are wasted, better suited to football punditry as he regurgitates the analysis he picks up from BBC Sportsound and the Daily Record. But I saw first hand that he’s best suited to sales as he had two new members signed up within minutes of arriving. And so it continued, as a continuous flow of supporters came to our stand – a grand mix of proud parents of players, new-found fans, as well as the vintage diehards all came knocking. All this activity came at a cost as a big cheer came from the enclosure. Looking up from the stack of new membership forms I saw the Broch celebrating the opening goal. A quick shout over to the sidelines confirmed that Willie West had nodded home a 20th minute free header. After missing the opening goal, I took the huff and vacated the stand and joined the Keith support for the remainder of the first half. Before long, events went from bad to worse, and on 42 minutes the KSC crowd made their way across to the Legion for the obligatory half-time pint – leaving me on my lonesome to pick up new members. Half time came and went with Keith holding their own, and the KSC contingent made their way back from the Legion surprisingly more vocal than when they left, and were greeted by a fantastic opportunity for Keith who were awarded a free kick 5 yards outside the box. An unrecognisable Ryan Keir, back from a prolonged injury which seems to have seen him lose his ponytail, stepped up with a zinger of an effort forcing the Broch keeper to make a save low to his right. Just as I was packing up, having signed up an incredible nine new members, I started to believe that we might sneak something from the game as long as the score remained 1-0. This hope was soon dashed though, when Fraserburgh doubled their lead on 62 minutes through Scott Barbour. In years gone by this would have seen the Maroons’ heads go down, but the fight was still obvious, testament to the good work Deano and his team have done in the close season. Our lingering hopes were killed off with 15 minutes left, when the ever-dangerous ex-Maroon Gary Harris came off the bench to slot the ball past Simpson and make it three – a goal which had me wishing that I had managed that half-time pint. All in all it was a great day for the KSC picking up a number of new members, giving us the opportunity to share our vision with the support – but most importantly it gave us the reassurance that what we’re doing is correct. So, we look forward to Saturday’s home match to moneybags Rothes. We’ll be at the game once again to take on new members. Many thanks to KSC treasurer Scott Andrews for agreeing to man the stall at half-time – whilst I get to enjoy some nice cold Guinness. KEITH – Simpson, Hutcheon, Smith, Manson, Robertson(Lennox 68), Spink, Macaskill(Berton 60), Brownie, Keith, Keir(Barron 72), Selfridge. subs unused – McAllister, Norris, Stewart. Referee – Mr L Duncan.